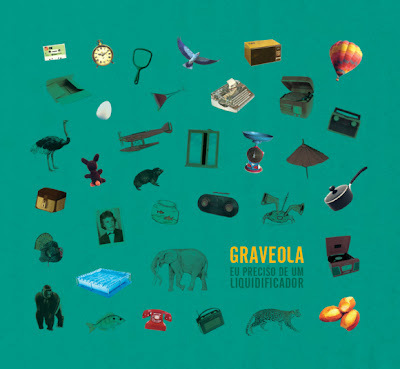 Graveola (the band’s full name is Graveola e o Lixo Polifonico, or “Graveola and the Polyphonic Garbage”) is a new, young rock band from Belo Horizonte, Brazil. Borrowing a phrase from the 1960’s tropicalistas, they call their sound “carnival-cannibalism,” and as you might expect Brazil’s indigenous psych-rock movement is a major influence on the band. Many of their songs feature unexpected shifts in tempo and time signature, unlikely instruments, found sounds and other elements that dirty up the sophisticated, elegant melodies that are characteristic of mainstream Brazilian popular music (MPB in the local idiom). This was precisely the strategy that Caetano Veloso, Os Mutantes and Tom Ze employed; Graveola takes that approach into the 21st century, so I guess you could call them post-tropicalia or novo-tropicalia. Whatever you call them, if you’re at all interested in the experimental side of pop music, or art-rock in general, or of course the left wing of Brazil’s MPB tradition, you will definitely want to check these folks out – a very enjoyable and impressive listen.